This past weekend was one of the best trips I’ve taken in Ireland so far. It was bittersweet because it was the last weekend trip I’ll be taking while here, but it was the perfect trip to end with regardless. A couple of friends and I went to Galway, on the western coast of Ireland and it was beautiful! Let me tell you about it. We left the bus station in Dublin bright and early around 8:30 a.m. and arrived in Galway at 11 a.m. From the Galway bus station, we checked into our B&B and decided to explore the town. If Dublin is the equivalent of Grand Rapids, then Galway is equated to Holland. It is a quaint little town that doesn’t have an outrageous amount of tourists, making it very manageable. Two of us wanted Claddagh Rings because they originated in Galway, and so we spent the better part of the afternoon searching for the perfect ring, but only after a great lunch at a local pub! 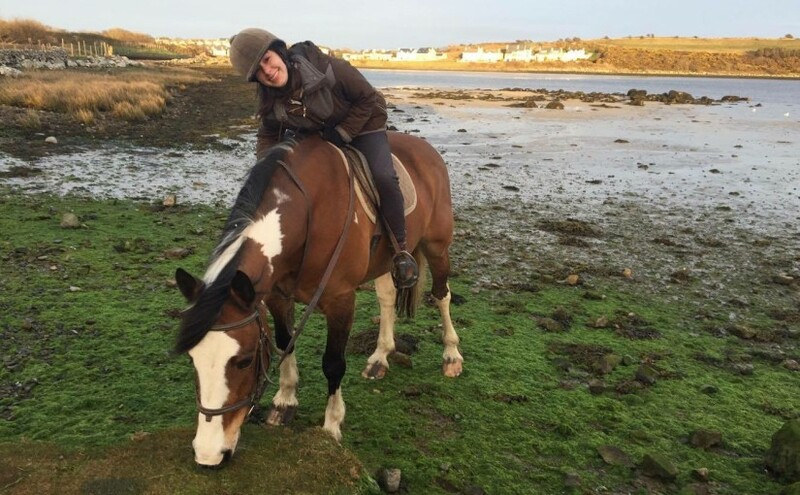 Then came the best part of the day: horseback riding on the beach of Galway Bay! This activity surpassed anything that I’ve ever done in Ireland. It encompassed Ireland’s beauty and made me even more grateful that I chose to study abroad here. We were unsure if we should go at first because the weather was bad, but as soon as we made the decision to go through with it, the clouds parted and we got to see the sunset from our horses backs! The horses were great (mine, named Sheebla, was a little stubborn, but I’d never ridden a horse before and she was testing me) and our guide was knowledgeable and kind. We rounded out the day by grabbing dinner at the Park House Hotel and a drink at a local pub. We were so excited to see the horses being brought out of their corals! This was my horse Sheebla. As you can tell, she was unsure of me from the beginning. She loved to eat, that’s for sure. Walking along the beach on our horses was a dream come true. We were so fortunate to see the sunset from our horses, too. Another awesome day. This was the day we went to the Aran Islands, which are located right off the coast of Galway. They are the Western most point in Ireland. Specifically, we went to Inis Mor, where the population is around 900. (The three islands that make up the Aran Islands are Inis Mor, Inis Meain, and Inis Thiar.) We got to the bus station at 9am and took a half hour bus ride to the ferry that would take us to the Island. The ferry ride took about 45 minutes so we got to the island around 11. Once on the island, we boarded another rickety bus that would take us around the island for the day. Our tour guide was born and raised on the island, so he knew everyone and everything that was going on around the Island. A cool fact is that the Aran Islands are part of the Gaeltacht, which is an area where Irish is the primary language. There are schools here that students can go to for three weeks to learn the Irish language. Needless to say, we heard A LOT of Irish being spoken and it was very authentic. Dún Dúchathair – which is basically like a mini-Cliffs of Moher, except without the guard rails. It was a little nerve-racking! Visited Seal Beach – there were seal’s heads popping up everywhere. Even from the shore, they were cute! Saw the place where the inn is from the movie Leap Year. Explored tons of abbeys and churches. Saw the beach where three currents meet and form the most outrageous waves. Our guide told us that during Hurricane Sandy, the waves here were 60 feet high. There were no guard rails at the mini-cliffs and it was a straight drop to the ocean. It was exhilarating! The beaches here were beautiful. I can only imagine them in the summer! The weather held out for us all day and it was beautiful. Check out the pictures I took! We, of course, ended the day by getting dinner at an Italian restaurant and finding a pub with some live music afterward. It was a great day. Sunday we headed home on an afternoon bus and decided it was one of the best trips we’ve taken so far. Only 12 days until I return home! There’s a whole slew of emotions I’m feeling about it, so until then, I’ve decided not to think about it. Previous Previous post: Poverty, Inc.